The Gelert Expedition 90 Litre Cargo Bag is constructed from tough durable fabric with one single main compartment with a full width and length opening for easy access. The lid also has a zipped internal pocket for all those must have in a hurry items and includes karabiner for attaching keys. The address card window pocket enables you to add personal identifying details without defacing the outside or using labels that can easily become detached. There are two padded shoulder straps (so you could carry this bag 'rucksack' style for short distances) and two side grab handles that can be joined in the middle to make a single carrying handle. There is also two volume adjuster straps that can either be employed to scrunch everything down tight or carry large items on the outside. Strong, robust and perfect for transporting all your spare, clean (& not so clean) walking gear which you can't fit or don't want to carry in your day pack. 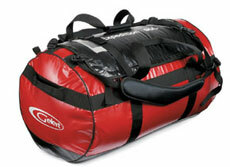 Anyone contemplating a long distance path this year - like Wainwright's Coast to Coast walk or The Pennine Way - and plan to just carry the essentials on your back and use a luggage transportation service for the rest of your gear - then the Gelert Expedition 90 Litre Cargo Bag would be ideal.